Swapping with friends is always fun! The package was filled with amazing goodies, from snacks to nail polishes and cosmetics. I decided to try the Face of Australia nail polish in Iron Ore first, with a layer of OPI Pink Shatter over it. 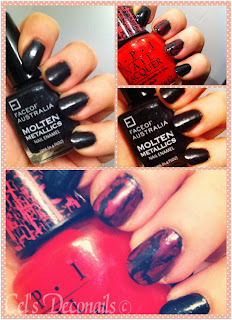 Iron Ore is part of the Face of Australia Molten Metallics collection. It's a beautiful black metallic colour and it worked really well with Pink Shatter. So many lovely nail polishes and brands I have never tried before and she even fulfilled my wish for the new Anna Sui nail polishes in the dress bottles. *does happy dance* I have already tried some of these beauties in a mani I did for my birthday trip to London (blog post about that coming soon). As you can see the package was full of spring colours and unique nail polshes plus so many cute goodies including a bow for my iphone (which I am using already ^_^). What a lot of fun stuff! 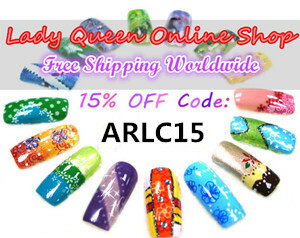 ^_^ the only problem is that I cannot wear them on my nails all at once! so fun, and so much cool stuff. :) thank you dear, I was so happy to take part in all these swaps.